Enjoy a game of football at Ca'Savio campsite. Want to have a closer look at Ca'Savio campsite? If you think Ca'Savio campsite in Cavallino-Treporti, Adriatic is the holiday park you, why not have a closer look, and check out prices and availability. Ca'Savio campsite family holiday park has 1500 pitches. 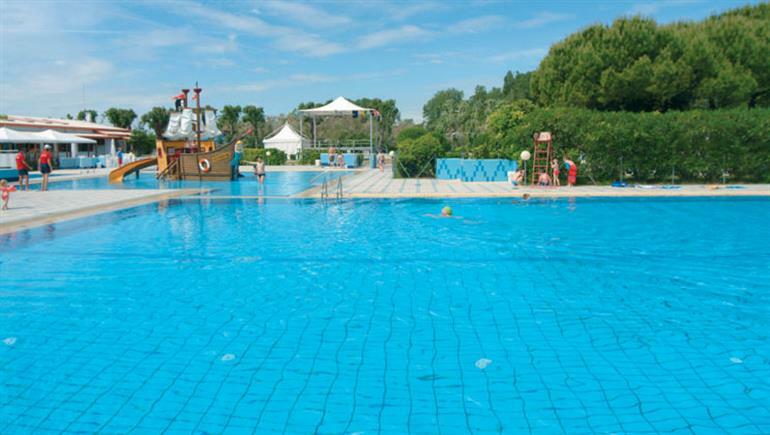 Eurocamp have family holidays parks all around Europe. Ca'Savio campsite (IA021) is just one of the family holiday parks in Cavallino-Treporti, Adriatic, Italy. Have a look for other holiday parks in Italy. You can also see what other people though with the reviews of Ca'Savio campsite. These are the reviews for Ca'Savio campsite. There are 150 reviews. Excellent site. I could live here! Another great hol.downside the park was very poorly lit around accommodation, walk ways were very dangerous to walk in evening. on the upside one of the couriers gave me some cream when I had a really bad bite.we have been holidaying with eurocamp for many years, we always book early but always seem to get accommodation quite away from facilities. It would also be nice to get accommodation thats gets the sun. Large park with good facilities. Very close to the beach and easy access to venice and the islands of the lagoon. Holidayed without a car and didn't miss one - all the sights reachable by bus and boat. . eurocamp couriers helpful and pleasant. Standard pizza and pasta options on site and in a cluster of restaurants a short distance away. Excellent gelateria close by. . there were a few negatives though - having been to smaller campsites on the past, the size of this parc and how close together the homes were to each other was a bit of a shock. Mosquitoes were a problem too - even at the end of the season. Finally, we were put in a part of the site bordering someones garden full of various birds. Got woken up by a rooster at approximately 430 every morning. . . but overall we had a good holiday - great location, park facilities and attentive eurocamp couriers. Lovely area. Ca savio has enough about it to enjoy a nice meal, a good coffee and some fabulous ice cream . the parc is in an exceptional location being a few mins walk from the town and the beach. Negatives were a few mosquito bites and not much else. Visited in sept when weather was perfect and area was quiter than high season..would go back tomorrow if I could. . Exactly what we had expected as had been many years before. We had an excellent holiday and are looking forward to the next one. Great for people on a budget. Excellent location for beach and venice. Ca'savio itself is nice and has some excellent restaurants. Nightlife was ok: happy our in bar, followed by rooftop bar next door. This bar does bogof cocktails for 5 euros. There is also a nightclub sunshine bar or something. That was closing down on one of our first days. Eurocamp showed themselves at their worst this holiday. the tent was broken so the side couldn't open, the fridge wouldn't close, the freezer door was broken and there weren't enough pillows for the beds. The children's couriers didn't turn up for the sessions advertised and once chased to start said that they were finishing the sessions early. They then spent the time with the children telling them they were tired and it was the end of the season...maybe so but it was the start of our holiday!! the second week did not have a children's courier. Whilst the blonde eurocamp courier was very helpful she was severely let down by the rest of the team. Great location for kids, great weather & close to the beach. Mosquitos terrible!! we had a great, but exhausting, holiday. This is not our first time at ca savio so we can't fault the the campsite. Other than the location from the airport and travelling distance from the uk we can't find an issues that we need to pass on. It's a great family site - the entertainment isn't to everyone's taste and we feel the 'childrens' evening entertainment which starts at 8.30pm with the happy disco is too late so we don't often partake in that. Adult entertainment is also not great so we don;t tend to enjoy that but for families and daytime activity the site is fantastic. Feels safe and secure - generally clean and the beach is fab. We had a marvelous time and I would recommend the park to anyone. the staff were all helpful and attentive. overall we had a lovely holiday, the park and its facilities more than met our needs and we may well return next year. Fantastic holiday, easy to get to from the airport, plenty to do on the park, close to the beach, accommodation clean (as a tent can be) and a good price for the tent and park during the summer holidays. The camp was very big - a holiday village really, we did not expect this size. our original pitch was so far away from the main pool and reception that the couriers recommended we hire bikes just to get around! that is ok if you know in advance and we asked to be moved which was facilitated on the third day. the facilities were good overall but we did expect the toilets to have seats and toilet paper. there was no soap dispensers in the loos either, I would regard soap for hand washing as an essential rather than optional requirement. Parc was excellent, everything you needed, good prices, good pools and food was as good as the outside restaurants. Very relaxing site but too many cars makes it dangerous for the children. Good bus connections and excellent beach. Best life guards at beach and pool I have come across. Only down side was too many mosquitos at night, although it would not stop me from returning, I would highly recommend this park, one of if not the most relaxing holiday i've had and i'm very well travelled worldwide. Great weather, a nice parc, close to beach with good facilities! just don't let the mosquitoes in!!! Great location. Accommodation very old and in need of some tlc. Dead ants every morning by the boiler and a very old shower! beach was fantastic, restaurant on site excellent and supermarket excellent value prosecco €6 wine the same. Main issue was kids club mini disco. Seats in rows so all adults standing as could not see the children, pools ok but toilets horrible. Transfer from marco polo a bit stressful water bus ,ferry then taxi €100 2.5 hours. Way home taxi direct 40 mins €90. Did not have any need to speak to couriers so cannot comment. Great location with direct access to a very good beach and very conveniently placed for boat trips to venice. I might try the area again, but not this site. . . the main problems are the very long walk to the shop and pool along a chaotic road shared between cars, skateboarders, cyclists and pedestrians, and the sheer number of german visitors, making it feel more like munich by the sea than italy. Excellent. We all thoroughly enjoyed it! Good location for visiting venice and aqualandia. Parc was very nice with good facilities. Reasonable prices for food and drink at the restaurant and snack bars. Park was really good but would not go with eurocamp again. We had a good time here and the holiday was perfect for our young family. Our pitch was close to the shop and both pools, and was not too badly overlooked, and although our neighbours may well have thought our kids were a bit noisy, no one said anything and it was all very friendly. This is a large park but well organised with lovely things happening all the time. Lego in the afternoon, run by the campsite, was a great success, as was the eurocamp kids club (hurrah time to ourselves!). great lifeguards and a good happy atmosphere around. I recommend this park. Well ran and managed parc. Always someone at reception to help. Great facilities, great location. Lots to do in site for children and families. A good holiday and great position near the beach. The camp was good but the pools were overcrowded and were only for play not swimming. The camp shop was good although parking wasn't easy round our emplacement. All excellent the staff were brilliant extremely helpful and enthusiastic . camp was very well equipped and the beach is superb. Great holiday the parc was clean and friendly, the beach was amazing as were the swimming pools on site. the local town of ca savio was good and had shops and restaurants and was on a bus route to various places with easy access to the ferry into venice. Had seen various reviews with regards to the mozzies and although we went fully equipped with bands and sprays none of them worked! the beach is amazing. there is a lack of places to eat outside the camp and depending on where you are situated in the park it can be a long trek into the town. the accommodation although fully equipped could do with an update (especially the bathroom, the shower door was broken and mould was formed on the seals. We had a great holiday - the atmosphere on the parc was lovely, very relaxed and chilled and full of people just having a good time. the weather was very hot but we managed to cool the caravan down with the windows open (mosquito nets on) and with the fan. we weren't bothered by mosquitoes at night inside the caravan but they were a problem at other times and we all suffered from quite a few bites. it's a shame that the parc isn't able to get the mosquito population under control as it would be so nice to be able to sit outside without the worry of being bitten. accommodation was great, lovely quiet spot. very clean and well appointed. the kids loved the pool and having such easy access to the beach and we all enjoyed the beach bars especially the sunshine bar with it's love music. A lovely holiday. Excellent location and park. Having direct beach access was brilliant. Base camp for teenagers was very good. We had a day trip to venice which was wonderful. Overall a great holiday for a family with teenagers but there were lots of younger families there as well who seemed to be enjoying themselves. 1 fan in a caravan for 6 people is in adequate. I think you would be better charging slightly more, but making all accomodation air conditioned properly. a fan in each room at least. A beautiful part of italy. A lovely parc with a gorgeous beach. The parc was great and the facilities were good. pools nice and clean. could have had more sun beds around the pool. kids were very happy with the pools and we only left the site one day during the week we were there. the supermarket on site was reasonable and very well stocked with food, toys and accessories. it had everything we needed. when we ate from the grill / pizza vans on site the food was excellent quality / good portions and good overall value for money. the customer care staff were helpful if we needed assistance and spoke good english. the only down side was the mosquitos which were horrendous on an evening. I had a severe reaction and needed medical care which took the edge of the holiday and resulted in staying indoors on an evening instead. I was the worst affected and my kids were ok with very few bites which didn't seem to bother them too much. my husband had a reaction to them but not a severe one. the only other disappointment was the welcome pack we paid for was not available and as we arrived late, we were looking forward to a cup of tea which we couldn't have. apparently the packs hadn't been delivered. I always enjoy the atmosphere of eurocamp. It's friendly, comfortable and easy. At this time of year (mid-aug) there was lots going on in the local area too: markets, festival celebrations. There was enough activities, entertainment and options to keep us entertained for our entire holiday. We would have liked to have stayed for longer. We really did enjoy it at ca'savio. A lovely park in a wooded, shaded setting, ideal in august. Clean, tidy facilities. Ideal for young families, not much to keep teenagers occupied. Eurocamp staff were very friendly and helpful.park staff were also very helpful and all spoke english. Ideal location for visiting venice, public transport buses and ferries very reliable and value for money. Excellent location, great beach. Very good public transport links to venice. Very large site and the shop etc are not centrally located. We had a fantastic time and would book with eurocamp again. Great campsite, with access to lovely clean beach, really good onsite restaurant and shop and only 10 mins to port for boats to venice, murano, burano and other islands. Nice caravan, but could have done with air conditioning as it was very hot at night. Nice pinewood tranquil spot. Kids loved it, and us too. Very relaxing fun holiday. Lovely parc, good location. Caravan was small and hot! Mobile home (407) was terrible, overlooked by everyone and zero space around us. Then eurocamp decided to house a group of german lads in a home a couple of feet away who wanted to sit up all day and night drinking and playing their music really loud. Had to tell them on a couple of occasions about the noise level. Also, even though a football pitch is advertised by eurocamp there is no such thing. Wonderful relaxed and safe feeling parc. Couriers couldn't have been more helpful. kids clubs fabulous - especially base - which makes such a difference to the holiday experience for all the family - as my teenage son is happy so we are all happy! Our location was good - close to the centre. Had we been further out this would not have been good. The park was very quiet with nothing for teenagers which we liked but was not what was expected by our teenage daughter! air con is desperately required and we did not have it so we had some sleepless nights. The beach is lovely and the best thing about the park. The base was lame. We stayed in a 2 bed esprit and were extremely disappointed with both the state of the accommodation and it's location in the park. It did not meet with our expectations as shown by the photos on the website. the facilities of the park itself were good but I would not stay in eurocamp accommodation again. We enjoyed our holiday but found the lack of air conditioning in the caravan difficult to cope with. Caravan basic but functional would definitely upgrade next time. Park clean but crowded at times especially around the swimming pool with not enough sun beds . We picked this parc because where it is situated. Our family like a bit of everything on holiday & being 35 mins boat trip outside of venice was ideal. However, the parc does cater for those who have younger children, but it didn't stop us. The static van we stayed in only had a van, we could have done with air conditioning. We eat several times at the restaurant, however, we did enjoy the stack bar better, for value & size of pizza. Good chose in both. Too many issues with accommodation including ac not working properly for most of the holiday when very hot and humid. Also swimming pools too crowded. Near by ca savio excellent and trees around accommodation beautiful. Supermarket on site a bit expensive. Good holiday, parc is well located for access to venice. Facilties on site are ok. Accommodation is a little tired. Air conditioning is advised, we didn't have it as we booked late and it wasn't available. Mosquitos were a problem around the minigolf, although other areas seemed ok.
Camp site far too big.the main road inside was a nightmare to walk along when your trying to avoid cars , bikes, scooters etc.you could see this was a problem especially with young kids as there is not a separate path.i lost count how many times I seen kids scooting out in front of cars and bikes.the pool is a nightmare..it had nearly 200 people in it a one point! there is only a handful of sunbeds ...and I mean a handful! you have to lie on your towel around the pool which is just a disaster ..apart from being uncomfortable as you are lying on the tiles, your towels and everything else gets soaked! venice is is great place to go and we will be back but not to ca savio. Clean and excellent pool guards . facilities good and food tasty and good value in restaurants . supermarket very convenient and well stocked and good price . staff helpful when organising trips and helping out with transfers. Only negative was lack of sun loungers at the pools . beautiful location onto the beach which was gorgeous . loved the pizza restaurant and kids activities such as climbing and golf. Lovely campsite. Great for children to be able to have freedom to explore in a safe environment. We loved being so close to the beach. . facilities and entertainment were excellent. The children lived rehearsing and performing a dance routine. Only things to note are the moblie homes were so tightly packed together that privacy was a problem. Accommodation needed more fans. Just too hot in the chalets!!!!! real mosquite problem also on sight which more should be done about. We loved our time at ca'savio and in italy. The campsite is clean and well kept and there is loads to do. The campsite beach is beautiful and perfect for young children who can splash around in the shallow clear waters. The ca'savio campsite staff and children's couriers are cheerful and really go the extra mile to try to make your holiday special. . however, this year we felt a little let down by eurocamp. We have holidayed with eurocamp for a number of years but this year we found a dirty, tired old caravan on a pitch which was far from the action and miles away from the other eurocamp vans. When we arrived and used the toilet for the first time the water pipe wasn't connected properly meaning that when the toilet was flushed water flooded the caravan. My husband fixed the toilet and we rang the couriers to tell them what had happened. A courier arrived and looked at it and said "oh I see." and then left again. No apology, no offer to help us re-clean and we have only been in the caravan for less than 5 minutes. Thankfully the weather was so nice that we only had to sleep in the caravan because if not it would have ruined an otherwise great holiday. Great parc, dirty, insect ridden, out of date accommodation that needs updating urgently. shame because the rest of the park is okay. shameful! Was easily the worst holiday I have had in a very long time. The reps were very good tried there best but the location of the mobile home was appalling. . the mobile homes (our was 136) were crammed in to the point where if I opened the kitchen window then I could reach out and touch the next doors car. it was nigh on impossible to get our hire car into the allocated space. we were overlooked by 3 over mobile homes giving us very little privacy so had to keep the curtains closed a lot of the time. . the camp bed in the twin room was constantly collapsing and the fridge turned itself off and the first night ruining all the food we had bought. . also it is absolutely pointless having mobile homes without a/c on a park where the temperatures were 30-40 degress every day. I appreciate that the weather cant be controlled but having 1 tiny fan per mobile home is virtually useless. to make matters worse out mobile home backed onto a small holding that had chickens and geese, so having slept very little because of the heat we were woken every day at around 5am by the cockerel. . . I understand that eurocamp have very little say on which part of the parc they get from ca'savio but it just felt like that they were crammed on as tightly as possible to maximize profit. . I was not impressed with the parc either. the roads and footpaths were made of of loose pebbles/gravel and were particularity hazardous on a nght time as there were no lighting and we had to rely on the lights from our phones to guide us home. the other problem were the pools. they were overcrowded and there were no where near enough sun loungers. 2 medium sized pools for a camp that large was a joke. I would say however that the beach was good. . I called on the dei fiori and marina de cevizia which were either side of our camp and the difference were immediately apparent. Proper tarmac roads, bigger pools and the on store shop was at least 30% cheaper. . we had an amazing time last year when we stayed at la croix du viex pont with canvas holidays which I might add was £350 cheaper than ca'savio. we saw eurocamps homes on the site and thought they looked good so decided to go with you this year and it was a big mistake. . we were so disappointed with the holiday that after 5 days we were looking for flights home. a summer holiday should be a time to relax with your family but we came home exhausted and covered in mosquito bites. . . . . .
We're a family of five, with three children between 2 and 8. this was our first holiday in italy, we've been to eurocamp parcs in the vendee region of france three times and always stayed in caravans, which is what we did again. we were disappointed last year by rotten weather in france and so we were looking for somewhere a bit warmer but we couldn't afford for the price to go up much from what we paid previously. . . we had a lovely time at ca'savio near venice and will certainly consider going back again. we were glad we didn't bother hiring a car, we got a return taxi from marco polo airport and other than a one-day boat trip to venice and several islands in the lagoon we stayed at the site in the pools, on the adjacent beach and using the facilities like the children's clubs. . . while the accommodation was a bit more basic than we've had previously, the large site seems very well run. the basics such as cleaning and emptying bins are frequent. the life guards at the pools and on the beaches were very active and evident. our children all seemed to enjoy the site groups, particularly the evening disco, and my wife took advantage of several of the morning fitness activities. the restaurants and takeaways on site were pretty reasonably priced, as was the large site shop. The parc was very well set up for families, with two large swimming pool complexes and the beach. . . lego club was a great success. However, the eurocamp club appeared to be more like a nursery setting and when asked about nuts in chocolate (our son is allergic) we were told "of course, there are nuts everywhere", just fill in the consent form - not great care. . the disco run by the camp was cheesy euro-pop, but the children loved it. . . finally, the tent was great. Very hot. We managed to get a fan, which was a god send. The tent was a bit tired, bits falling off such as toggles. Relaxed experience with the beach close by and all camp facilities on hand and although we were there at peek season there was no shortage of availability for any of the services nor were the pools etc. Over crowded. The beach is wide, clean and straight off the site and the sea safe for kids and swimmers. However the camp site itself is a miracle of space management. Most of the mobile homes and tents are very close to each other and although you quickly get used to it, it does shock you on first arrival.they mitigate this by altering the angles of the mobile homes so you're not actually face to face with your neighbours but be warned they are close. We did not have a car so you plan to fly you need to budget for airport transfers - 100euro each way by taxi if the bus times do not suit. If you like to eat out there are a couple of really good places within 10mins walk of the camp and the prices are very reasonable. Bike hire was easy and cheap at 9euro for 24hrs - so if you book at 2.00pm then the bikes yours until 2.00pm the next day and there are some local back roads to enjoy. Not many so don't be tempted to book for too long up front and then realise there's not that much to explore. The bus from the local town which is 10 mins walk takes you the 4km to the water taxi to venice so door to door from the camp to st.marks square is less than an hour. Overall we really enjoyed our time there and the camp staff are great. This is our second visit to ca'savio. the site is clean and well-maintained. the swimming pools are well-marshalled by lifeguards who ensure that any anti-social behaviour by teenagers is dealt with swiftly and effectively although the sun-bed hogging by some who place towels as soon as the pool opens and then do not use their beds until well into the afternoon is annoying. the shop is well-stocked and reasonably priced. the beach is clean and worth a visit although you would probably need to buy a sunshade to take with you as there is no shade there and it does get ridiculously hot. the village of ca'savio is a short walk from the site - I recommend villa gentile for a meal out. the only real downside to the site is the amount of mosquitoes there were this year - there were no where near as many last time we came. Great holiday, lovely parc. Eurocamp couriers very helpful and polite. The only complaint I have is there was no air con in our mobile home, apparently 2 bed vans donot have it, according to your couriers. It was very uncomfortable in the heat wave without air con and your couriers had a shortage of fans, not their fault, so maybe for future reference more fans could be made available. Had a great holiday. The 4 children had a sickness bug so that took some time away, but not camp's fault. We had a great pitch in a very busy park - I think the bigger homes were in a quieter area. . pools lovely - but quite uneventful for our 8 and 10 year olds - either too deep or too shallow - no slides and guards very strict on thing like balls, messing about etc in pool. . amazing pizzas. Really close to a beautiful, warm beach. Lots of people selling things on beach but really respectful, not pushy. . good amenities in campsite - large shop, good opening hours. . we usually take a car and drive to france, no car this time, and not needed but husband found it restricted. . didn't use kids club (4 children 10.8, 4, 4). would definitely go back. . 7/10 accommodation because so hot would expect air con as standard. Very busy camp, facilities good, quiet in mobile gone areas, mosquitos pretty bad! swimming pools great but super busy, would recommend for anyone with children! . restaurant and bar expensive!! 4 euros 50 for a pint!!! Excellent clean parc with good facilities. A very enjoyable holiday! We had a great time, despite my initial reservations at how many people were there. I realise that is the nature of these places, but I was there for my kids, not for me. I did, however, genuinely enjoy the week, and was pleasantly surprised at how all those people melted into the scenery. The beach was never too busy and even the pool was mostly not too crowded. The site was quiet and civilised, and folk were pleasant and well-behaved - even the kids! We liked the swimming pools and the bars and restaurants and the beach but felt that holiday was a bit spoilt by cleanliness of the caravan. When I made the beds up and lifted the mattress there were lots of stained tissues under a couple of the mattresses and the toilet smelt of urine very strongly even on arrival and indeed there was a pool of urine behind the toilet. We did notice eurocamp staff cleaning other chalets in between customers and they were literally in there for a few minutes between customers. I am a mother of 3 boys and am used to noxious smells and mess but when on holiday it's nice to be looked after a bit and would have preferred chalet to be much cleaner than it was. For this reason I don't think we would go with eurocamp again. It has put us off unfortunately and this was our first time with yourselves. Very large and noisy campsite, the best part was the lovely beach adjacent to the campsite. Shop was very good but would probably not recommend for families with young children. Campsite reception staff were helpful. We really enjoyed being close to punta sabbione so that we could sight see and loved having the beach at such close proximity. Great park close to venice. accommodation clean would have liked better bed lined. eurocamp staff very pleasant and helpful. This park is huge, and our accommodation was a good 14 min walk from reception, which is only a problem when arriving late with cases. Other than that you can walk off the pounds ! getting to venice is easy, you can buy tickets on the camp reception, and was the highlight of our visit. The site has a good beach, and the shop was not as expensive as other reviewers indicated, plenty of fresh food daily, english spoken widely. This camp is in a wooded area lots of shade, sometimes too much, but there are lots of gnats (mossie's) and despite stringent defences still managed to get bitten,but not enough to ruin your holiday. The local restaurants are excellent, never had a bad meal ,and again prices as I thought they would be, villa gentile & fungi pizza & restaurant were really good. The pools and camp restaurants are clean and well managed, the staff overall were faultless. You can hire bikes & scooters and plenty do! and the main thoroughfare is really busy. If you want quiet, have difficulty walking this is not for you ! it is as described , a lively park. We went as a couple so were expecting a fair amount of noise from the families, we were hugely surprised to find it was both exciting and peaceful. The whole complex was so well thought out and organised. We were so pleased to find no dogs were allowed which made a safe environment for the children. All the staff were most helpful and friendly, nothing was too much trouble. Well done eurocamp. Good overall holiday. Would like to see more lighting off the main thoroughfare. The camp was great although the mosquitos were a big problem although can't fault camp as they did spray to reduce the problem. Facilities were great but camp would benefit from a playground for smaller children further up the campsite. Campsite would be improved further by a pavement or walkway up main campsite road rather walking in the road. Overall we enjoyed our holiday but wouldn't return to this area due to the mosquitos . Eurocamp ca'savio was a great place to base ourselves for venice. A nice, relaxed atmosphere and excellent facilities. Nice little town, lovely beach. the parc was very clean and well maintained. eurocamp staff were great. Lots of facilities on site, lovely beach, nice restaurants close to the camp site. fireworks on saturday evening were fantastic. easy to get to venice and younger children really enjoyed aqualandia. Perfectly situated for easy access to venice and surrounding islands, beach and for fun water park. We initially booked for six in a tent but one of our party couldn't make it, which was just as well as there would not have been enough room in the tent. Campsite advertised as a quiet family campsite- which it was, however, extremely noisey off site beach bar blasted out music which on one night didn't finish until the early hours of the morning. There is no way eurocamp wouldn't be aware of this so to advertise as quiet family is a little off the mark and a disappointment from eurocamp. This was our first eurocamp holiday and we had a fantastic time. The parc is big with plenty to do. it's close to a lovely beach and we made use of public transport to get to venice. the tent was clean, spacious and comfortable. the only minor issue we had was that our beds felt a little worn out. The park is huge but the eurocamp sites aren't too far from the main reception area. We had a tent and the position wasn't good as we were just outside the toilet block and the children couldn't play outside the tent easily,but it was clean and comfortable. The campsite has good facilities and the evening entertainment was great. We hired bikes from the shop in ca savio and that meant we could get around - its very flat and bike friendly. We did not need a car for the week we were there and its easy to get the boat into venice. Overall a great holiday - just could have done with less mozzies and more sunshine! We had a brilliant holiday, I would recommend this park to anyone, the amenities were good, excellent beach and well located for easy access to venice and the islands. We did not have a car but public transport was easy. Lovely park, visited three times previously and always enjoyed it. The caravan was very old compared to other parks we have visited recently.the windows were very dirty around the edges and worn. The parasol was broken on the patio set. The roller blind in the bathroom was broken. My husband is disabled so I asked for a nightlight and none of the couriers seemed to know what it was, even though it says in the welcome pack that they will provide them and we have had them at other parks. We had a very nice holiday.the park was very well set up for children and there were plenty of things to do. The on site food wasn't very good but edible. The holiday was very good value in comparison to staying in a low budget hotel. It is in a good location for exploring venice the shop was expensive compared to the stores outside. There were very few english people there.the weather was not a reliable as we had hoped for europe. This was our second trip to ca'savio but the first for 12 years. we had very fond memories of this parc as we had a fabulous holiday there when our children we 10, 8 and 3. we returned this year with 2 15 year olds and it was every bit as good as we remembered - although we had a very different type of holiday this time. it was a shame the weather was so mixed the week we were there but we hired bikes and did lots of exploring on them and also had boat trips to venice, burano and murano. all four of us voted burano as out favourite place to visit. Overall disappointing, italy and this holiday were expensive, the quality of accomodation was poor and the site was large and chalets crowded together with dull pools. Beach was nice except for hawkers. Siesta time very tedious. Not much to do away from venice. Lots of mosquitos. We will definately not visit this part of italy again. Very good chalets in a nice park. very good help from the couriers. food and bar prices very reasonable. eurocamp were helpful booking us flights but ignored the transfer which could have been very slow by bus or expensive by taxi. when I realised I phoned eurocamp, and a staff member helpfully suggested city-airport-taxis.com. I hadn't heard of them before but they did very well. much cheaper than a cab at the airport and paying in advance reduced the risk. eurocamp may wish to recommend them more? eurocamp's funstation was very good for our 4 and 6 year olds. great to be within easy reach of venice. A fantastic base to explore venice and the other islands. The beach is so close and clean and the camp has all you need . Excellent site in a beautiful location. Brilliant for kids,, mine age from 5 to 13 & all catered for by eurocamp kids club activities, which were age appropriate & great fun. also gave me a good break to relax for few hours. The site was clean, well maintained, secure & the staff friendly and helpful, nothing was too much. Pools were safe and supervised, the beach was safe with great paddling for younger ones. Only thing I would say is the resteraunt on site is a bit on the expensive side for food that wasnt that good compared to value & quality found in resteraunts just off site. . but overall a wonderful campsite, easily one of the best ive stayed at in europe so far. Highly recommend. We have never camped before and usually hire a villa. so we didn't know what to expect. everything was brilliant!! my main concern was the cleanliness of the mobile home - needn't have worried. I would go again. one suggestion - more pillows please!! Good location but very shady pitches due to the trees. Also a lot of mosquitoes in area which would put us returning in the future. We visited this august for a total of 11 days. The site is more like a village due to the size of the place. We were originally put on row 37 (subsequently moved following a request to our holiday company eurocamp who I must say are truly excellent) which was just short of a km walk to reception.. a bit of a pain where needing something from the shop, or forgetting something on your visit to the pool! therefore bikes are a must!..which is where the onsite costs in particular start to mount..from wifi, to the shop, restaurants, drinks, bike hire, you name it, the costs of this site are very expensive I found. This is by no means a slight on eurocamp who's holiday price was as competetive as ever. . . barring the costs side of things, the site is good overall. It's location is spot on for the local beach. It's also very close to the local town of ca savio which has a few lovely restaurants. The staff, both ca savio and eurocamp were also excellent..especially those dealing with the entertainment and kids clubs! the site has 2 swimming pool areas (both large and offering a good variation of pools for kids of all ages), is very clean, with a generally nice atmosphere. . . for those driving, my tip would be not to bother with the cost of a hire car unless you plan longer trips to treviso etc. The main islands (venice, morano, borano) are all accessed via boat therefore, so barring the airport to site travel we found car hire a waste of money. The access roads between the site and cavellino (approx. 10km away.good market on a tuesday :-) ) can be a nightmare traffic wise due to the amount of sites on this stretch, again highlighting the benefit of bike hire. Save you money on car hire and get a bus to and from the airport, and hire bikes (off site) for the week. . despite the annoyance of mosquitos and of course the cost side of things i'd definitely consider a return at some point in future..
As a long time user of eurocamp we were disappointed how dirty the mobile home was. I believe you get better service when there is an older rep on site overseeing. This is our second time at this park. The first time we went was three years ago. It was a holiday we didn't want to end. . this year was disappointing. The kids club was all one age group. How can a 4 year old have the same interests as a 10 year old. There was enough staff to split the group up at least. . our van was too cramped together. We couldn't get my daughter a rental bike as the pathways to our van were full of stones!. . our van was also very cramped, no storage for groceries, and no wardrobe space in the bunkbed room. . it was also the 1st holiday we didn't sit outside on the sun loungers as we never got the sun shining on our van. Too many trees!. . the entertainment was terrible. I think we watched it twice in 2 weeks!. . the beach was the same, fantastic! We had a fabulous holiday in a lovely part of italy. Campsite was brilliant, great pools, supermarkets on site and good clean entertainment . weather fantastic and we all came home feeling very relaxed and great memories of a perfect holiday. Great parc with facilities for all the family. the tent was near everything but still in a lovely quiet setting off the main drag. the beach was beautiful and the kids loved the pools. I was particularly impressed with the lifeguards who took their jobs really seriously and made the pools feel very safe. An absolutely amazing holiday! we stayed in 3 eurocamp parks on our trip. Bella tolla, switzerland, ca savio, italy and la croix vue pont in france. I cannot fault anything regarding the holiday, we will definitely be using eurocamp again. This park is large and quite busy. That said, my accommodation, nestled in the midst of the pine forest, still managed a feeling of peace and quiet. I have a disability that gives me mobility difficulties, and in this respect I found the size of the park a challenge. However, the facilities on the park adequately provide all the essentials for a 2 week stay. The animation and entertainment programmes are excellent and my 2 boys, 9 and 6 were spoilt for choice. The pools and the beach are shallow and safe for children, and they all have full life guard coverage. We had a great time in ca' savio. There were plenty of things to do on site which was great seeing as we took up the chance of the advertised 'car free holiday.' the pools were fantastic as was the beach - and very accessible. We took a trip into venice for a day which was very straight forward and good value at €22 per person as this included a bus to the local port, the ferry across to venice as well as a days pass on the vaporetto. Great holiday!! we scored lower on parc as many of the on site facilities did not accept credit cards - this was particularly surprising in the cases of 1, the excursions and extras booking shop and 2, doctor consultations, which were €50 per consultation - it isn't so much the fact that they didn't take cards, but that it is something we feel that should have been made very clear to us beforehand. Also scored lower on the value for money as for a basic tent (which is what we chose) the full price is pretty steep. Parc was very large and not as attractive overall as some other eurocamp locations. The pitches are not particularly spacious and you are very aware of your neighbours. The facilities at the campsite were good, especially for children and teenagers. Particularly good were the shop, with a very wide range of essentials (and more) for reasonable prices, and the snack bar with excellent pizzas, ice-creams, etc. The beach was great and none of the facilities felt too busy at any point (with the exception of the washing machines). although there was regular evening entertainment, it wasn't too intrusive. The accommodation was very clean and well-equipped. The couriers were extremely helpful and brought round a new frying pan after our neighbour (who had borrowed it) noticed it was a bit scratched! venice was an easy and fun daytrip on the boat. The big downsides were the mosquitoes - we all got badly bitten despite many different precautions, and looking at the legs and arms of our fellow campers, so did everyone else. Also the road in and out of the campsite can get extremely busy at peak times. We had to travel to the airport a couple of times to pick up / drop off family members. This was around 45 - 50 km and the journey took anywhere between 40 minutes and 4 hours! there are no alternative routes - so be warned! It's a good parc and the pools and facilities are more than adequate. The beach is a great bonus too. The team on site were always friendly and professional. However, the lack of information given about mosquitos on site (significant bites and nuisance) and to a much lesser extent the fact you cannot have a bar b q are major drawbacks. We would need to find an alternative in future. We enjoyed the most fantastic family holiday. The setting, facilities and helpful friendly staff contributed to a superb time. A wonderful parc, very clean with great facilities. Quiet at night. Great swimming pools, and superb access to great beaches with a gentle slope into the sea. The accommodation was a little tired, but was very clean and usable. Air con would have been quite useful, and although other people have said that they were able to extra fans on request, we weren't able to. The children's club may be better for older children, our 5 year old felt a bit isolated. This was made up for by the free lego sessions at 15.30 every day organised by the parc itself, you may need to queue though. Recommended holiday venue though. We will be back, but maybe booking with the parc direct next time. Great spot, though we struggled with the heat at night (couldn't get accomm with ac) and the mosquitoes. kids loved the pool complex. ferry to venice 5 min drive away and easy to get (paid) parking. we spent our afternoons and evenings in venice - fabulous! Overall a great holiday. Stayed opposite our friends. Kids had fun, lovely being near beaches. Mobilehome however was a little aged and run down and the parc wasn't quite as great as we had hoped. Pools lovely and very big. great to have the lovely coffee bar next to the quieter one. Bike hire brilliant and so essential! optional lights on the bikes though please!!. I love the trees and shade in this camp and of course it's amazing proximity to venice. Disappointing cafe when we arrived. mediocre stale food and school dinners ambiance inside the main cafe. the restaurant looked a lot nicer but wasn't open. we would have eaten at the camp much more if the food had been better. Eurocamp couriers lacking in enthusiasm and knew very little! . germans are lovely but to have only germans all around us was a bit isolating, why no more english people?. Very large park; pine trees smelt lovely. Great pools and great location next to the long beach. Good supermarket. Wash block cleaned almost continually. . fantastic day out in venice. . tent well furbished and roomy, comfy beds - only problem was rain water pooled just inside the entrance which got annoying. Insect repellent recommended; take torches. Very nice parc in lovely setting with plenty of shade. A fantastic family holiday. The parc and facilities were great for our 2 young kids (aged 4 and 2 at the time). the pools and beaches were never busy and we never queued for the shops, cafes etc (depite holidaying in mid august). the parcs access to the local town meant that we could spend time away from the parc with ease. We also managed to visit the main tourist islands as well as venice. I would highly recommend the parc to families with young children. Excellent site for our young children. Mobile homes a bit crammed in, plus no a/c. However, we really enjoyed the holiday. We are used to smaller sites which have a more friendly feeling. This site felt simply too big and too busy for us. We did not find the eurocamp couriers very friendly or particularly helpful, in contrast with our experience at other sites. Due to the size of the parc there was a lot of walking. The shade from the pine trees was very welcome but I would strongly recommend bringing a car cover to keep the needles and resin from completely covering it. The beach nearby was very nice with a safe area for children to swim and the swimming pools were good, though busy in august, the main road through the parc was usually a chaotic mix of cars in both directions, bikes, people walking, children on skateboards etc, and we felt it was actually quite dangerous for young children to walk on, though we didn't see anyone actually getting run over. Our accommodation had no air-conditioning which made it uncomfortable at night - the fan provided was essential for sleep and we had to travel to buy another for our son's room. The shop on-site offers a really wide selection of items but it was costly. We travelled to a local supermarket also, which offered better value for money. Great park lots to do. You pay for what you get!!!!! great parc,clean and for the size of it didnt feel too over-cramped. The eurocamp staff were useless, playing on their phones, never around. We did keycamp portugal last year, and they were really friendly and helpful.. Camping ca savio is a very nice site, great pools, very good restaurant, bar, snack restaurant, good entertainment & a very well stocked but pricy supermarket (which is always to be expected!). there are very good restaurants within easy reach & a much cheaper & large supermarket approx 15 mins walk. Our main criticism would be the lack of fans in the accommodation. We only had 1 fan to cover 4 rooms & it broke!! beach is very very good, very clean and a nice warm sea. There are a huge amount of beach sellers walking up & down all day, but they become humerous after a while! we just changed our language for no thank you each time!!! overall a very nice, clean & well run site with very helpfull ca savio staff. Great parc for seeing venice. Beach location a real bonus. Great beach and nice pools, good weather etc. Needed air con, advance warning on mosquito's and accommodation needs upgrade. Lovely campsite with wide range of activities for all. Restaurant reasonably priced and beautiful setting. very close to venice which was an added bonus. Would go back! A fabulous camp site with lots of things to do for the children. Very close to the beach and several pools to enjoy. Fun activities during the day and evening to keep the kids entertained. Good location. Great family resort. Slightly disappointed with the parc as it was much quieter than expected and immediate area does not have much to offer in terms of access to shops & restaurants. but beautiful beach right on doorstep, and of course venice & it's islands are easy trips. Accommodation was good and in fairness we did not really need the couriers. We selected the parc for due to its locality to venice. Lovely parc with lots of activities and fabulous beach access. Lively without being too loud. We did an afternoon trip to venice and would also have gone to murano/burano if the heat hadn't sapped our energy so much! ideal parc for our party with a 5, 9 and 12 year old. Pools were clean and life guards were attentive. The lego area was a really welcome addition. Good parc restaurant and snack bars. The onsite shop was considerably more expensive that shopping at the local supermarket but well stocked for all essentials. We didn't use the kids club at the park as we had so much else to do but it was disappointing that no one from the kids club came to see us, and, the one day we did want to go the timetable at the reception desk differed from the one at the kids club tent so we had missed the activity for that day. Would recommend this parc and would definately visit again! fab week. We all had great time, plenty to do. Used to dread going back to caravan though as it was unbearably hot..lots of sleepless nights. Caravans and other accommodation very close together so we had little privacy. Accommodation very basic. It was a lovely location, easy access to venice. the camp was very well organised and with good facilitties. Had a really lovely time, the pools were great and the facilties were kept very clean and tidy. The beach was very clean.